Today I’d like to cover an app called Dosh that is currently in a public Beta. The Dosh App pays you cash back for your in-store shopping, online shopping, and for traveling. Overall it’s a really cool app that has several ways you can earn. As mentioned, the app is in Beta, so there have been some reported issues with the app, but from my experiences, they’ve worked through them and got them fixed. Just a heads up, with in-store shopping, you have to shop at participating stores, based on your location there might not be many stores available. Of course, online shopping and traveling work anywhere so you can still take advantage of those ways to earn. Even though Dosh is legitimate, it’s not going to be a huge income, you obviously have to spend money to make any with Dosh. If you’re interested in making a full-time income online, check out My #1 Recommendation to learn how I made over $13,000 online last month! In this Dosh App Review, I’ll cover how to earn, how to get paid, the complaints with this app, and if it’s legitimate or a scam! This post has a ton of comments where I’ve answered some really good questions. The app is 100% legitimate but if you have any questions about this app I’ve probably answered it in the comments! In this Dosh App review, I marked them legitimate. So far I’ve enjoyed using the app and have earned some cash back on a few regular purchases I make in my area. At this time the app is still pretty new, my biggest concern is how many offers are available in your area on the in-store shopping side of the app. No matter your location, you can take advantage of the travel and online shopping, but one of the impressive features of this app, in my opinion, is the in-store shopping. As long as you live in a decent sized city, you should have plenty of available offers. Again, at this time the Dosh app is still new, but I think it’s going to be a very big app that is an easy earner in the future! Make sure to check out my favorite shopping app Ibotta. My favorite way to earn with the Dosh App is the in-store offers. This part of the app is location-based, so you have to visit participating stores with current offers. As long as you live in a decent sized city, you should be fine and have plenty of offers. The way this works is you link your debit or credit card (they pay a $1 sign-up bonus per card), and when you make a purchase at a qualifying store, you’ll earn cash back automatically without having to scan a receipt. They currently pay you 7% cash back on your entire order at Jack in the Box. Currently, some of the offers close to me are from other restaurants that pay 5-10% cash back on your entire order! The Dosh app also provides cash back to popular online stores. Some examples are Fitbit, RayBan, Nike, Overstock, Toms, Callaway, and a few hundred more! Most cash back rates range from 3%-6% percent of your total purchase. All you need to do is visit the store through the link inside the Dosh app and make a purchase. You’ll earn a percentage back on your online purchase. You can see a full list of online stores available at Dosh.Cash! With travel cash back you can get paid to book hotel rooms and activities. Choose where you’ll be traveling and the type of hotel room you’re interested in. You’ll see a list of available hotels, the price per night, and how much you’ll earn per night! I’ve included screenshots below of the process and an example of how much you can earn per night. 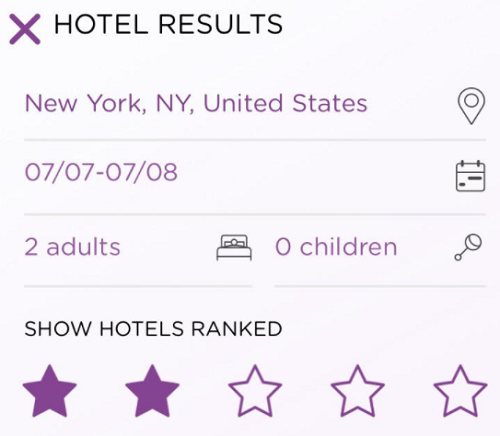 As you can see you can edit where you’d like to travel, find a perfect hotel for you, see how much it is per night, and how much Dosh will pay you per night! This doesn’t just work in the major cities. I’m in a small town, and most of the nearby hotels are listed paying anywhere from $10-$50 per night! Dosh offers a referral program that can be very lucrative if you can get your friends to join and use the app. You can invite friends via Facebook, Twitter, Text, Email, or just paste your link anywhere you’d like. You’ll earn $5 once your friend joins and completes their first cashback whether it be in-store, online, or for travel. Once you have $15 in your account, you can cash out via PayPal, Venmo or Direct Deposit. 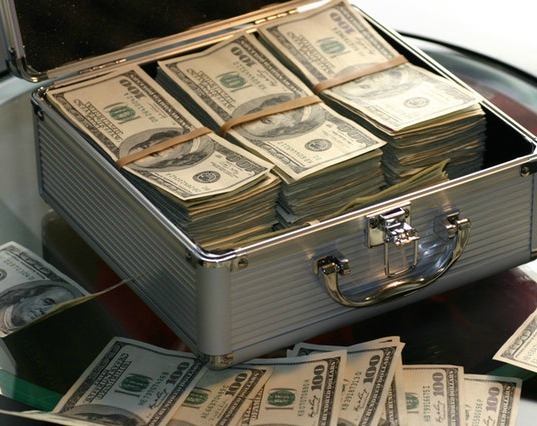 Money should show up in your account within 2-3 business days. Update 2017: I received my first payment within a few minutes. 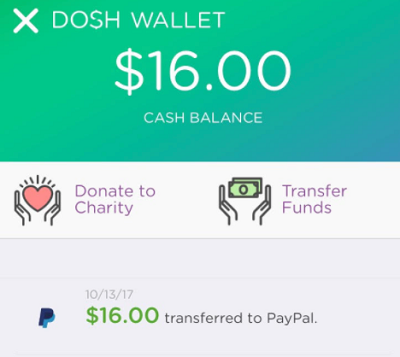 Unfortunately, Dosh uses another company to send payments, so the screenshot below doesn’t say anything about the Dosh app on the PayPal transaction. With that being said, I also showed where I had $16 in my account and where I requested a payment for $16 via PayPal! The money showed up in my account within just a few minutes! One major concern some people have is linking their debit and credit cards to Dosh to get automatic cash back on their in-store purchases. In their FAQs, they address this by saying the no credit card or bank account information is held on the app or your servers. Also, all the purchase transactions you make using Dosh are encrypted. Honestly, if you’re not comfortable connecting a card, I’d just skip it and use other ways to earn cashback. It’s not worth getting worried about if you’re not comfortable. I’ve linked my cards and haven’t had any issues. If you visit the Google Play store, you’ll see some negative reviews that are a little old complaining about the app not working. Based on the time frame of those reviews, it seems that they’ve made changes and have the app working much better now. I downloaded the app on my iPhone and had zero issues getting it installed, signing up, linking my cards, and getting credit. Thank you for taking the time to read my Dosh App review, the app is not a scam. Overall the app is pretty good, and I really like the automatic earning without having to scan receipts. With that being said, Dosh doesn’t work at all stores, so it’s a good app to use and combine with other apps to make as much cash back possible. I recommend joining Dosh and using it for automatic cash back and any travel expenses. You can also use Ibotta to earn cash back for your grocery shopping that doesn’t give you cash back with Dosh! To join visit Dosh.Cash you’ll earn up to $5 sign-up bonus for linking your credit and debit cards! $5 Sign-Up Bonus! Do you think the Dosh App is a scam? I’d love to hear your thoughts in the comments section below!